This news release has been edited to include a new event date as a result of the February 9 snowstorm, which caused City College to be closed. After experiencing two destructive tropical storms in as many years, New York City finds itself forced to adapt to the reality of catastrophic weather events resulting from climate change. However, it cannot rely on simple fixes. Rather, it needs to create new urban landscapes with the capacity to negotiate social, cultural, and environmental forces, argues Denise Hoffman-Brandt, associate professor of landscape architecture in City College’s Spitzer School of Architecture. 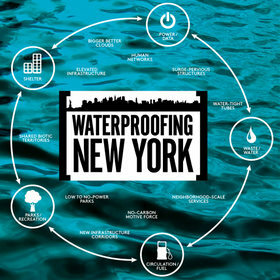 Professor Hoffman-Brandt and Professor Catherine Seavitt Nordenson are the organizers of “Waterproofing New York,” a daylong conference to explore the impact of past and future storms on five key infrastructure systems: water/waste, power/data, circulation/fuel, parks and recreation, and shelter. The event runs 9 a.m. – 5 p.m. Saturday, March 2, at the Spitzer School of Architecture, 141 Convent Ave., New York, N.Y. 10031. It is free and open to the public. Attendees are requested to RSVP on the event Facebook page. Speakers include municipal leaders, scientists, engineers and designers. The event has been shaped to appeal to a wide audience of designers and members of the community interested in New York’s future. The conference hopes to reveal the operating systems of the city in a way that gets people to view “Waterproofing New York” as an act of coordinated yet opportunistic, pragmatic, and inventive city design. In addition, it is intended to support emerging skepticism of a big barrier "fix,” as well as the unplanned, uncoordinated shoring up of individual enterprises and discreet sites that would ensue without design and civic leadership. The event is organized around panels specific to the infrastructure sectors. In each session, two policy and practice specialists will present their thoughts on the key issues pertaining to their area of expertise. Then, two designers will engage the specialists in a discussion of the implications of the physical manifestation of their ideas for building an adaptive, waterproof New York with a reduced carbon footprint. Distinguished Professor Michael Sorkin, director of the Spitzer School’s urban design program, will present closing remarks. The conference is hosted by the Spitzer’s School’s landscape architecture program with support from the Municipal Arts Society, American Society of Landscape Architects New York chapter and the Institute for Urban Design. Jeanette Compton, director of green infrastructure, New York City Department of Parks and Recreation, and adjunct professor, Fordham University. Paul Mankiewicz, executive director, The Gala Institute. Lydia Kallipoliti, assistant adjunct professor, Cooper Union, Columbia University. Kate Orff, assistant professor of architecture and urban design and co-director of the Urban Landscape Lab, Columbia University. Frank Ruchala, assistant urban planner and designer, New York City Department of Planning. Bryan Stigge, director, Level Agency for Infrastructure. Chris Reed, associate adjunct professor of landscape architecture, Harvard Graduate School of Design. Miguel Robles Duran, assistant professor of urbanism, School of Design Strategies, Parsons The New School for Design. Petra Todorovick Messick, senior officer, Amtrak Outreach and Communications – North. Kevin Foster, associate professor of economics, The City College of New York. Denise Hoffman-Brandt, associate professor and director of the landscape architecture program, The City College of New York. Georgeen Theodore, associate professor and director of the infrastructure planning program, New Jersey Institute of Technology School of Architecture. Dennis Burton, administrative horticulturist/forest restoration manager, Van Cortlandt Park. Erika Svendson, research scientist, U.S.D.A. Forest Service, Northern Research Station. Catherine Seavitt Nordenson, associate professor of landscape architecture, The City College of New York. Gullivar Shepard, associate principal, Michael Van Valkenburgh Associates. Thaddeus Pawlowski, long-term planning advisor, Mayor’s Office of Housing Recovery. Mark Ginsburg, founding partner, Curtis + Ginsburg Architects LLP. Lance Jay Brown, ACSA Distinguished Professor of Architecture, The City College of New York, and co-chair, AIANY Committee on Design for Risk and Reconstruction. Deborah Gans, professor, Pratt Institute School of Architecture. Hilary Sample, associate professor, Columbia University Graduate School of Architecture, Planning & Preservation. Michael Sorkin, distinguished professor and director, Graduate Program in Urban Design, The City College of New York.